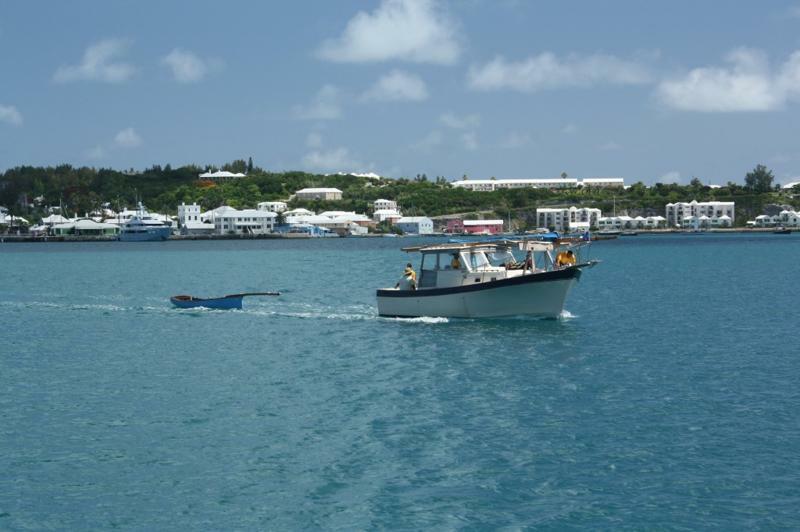 While orienting us to Bermuda our new friend Audrey told us about the Bermuda Fitted Dinghy. 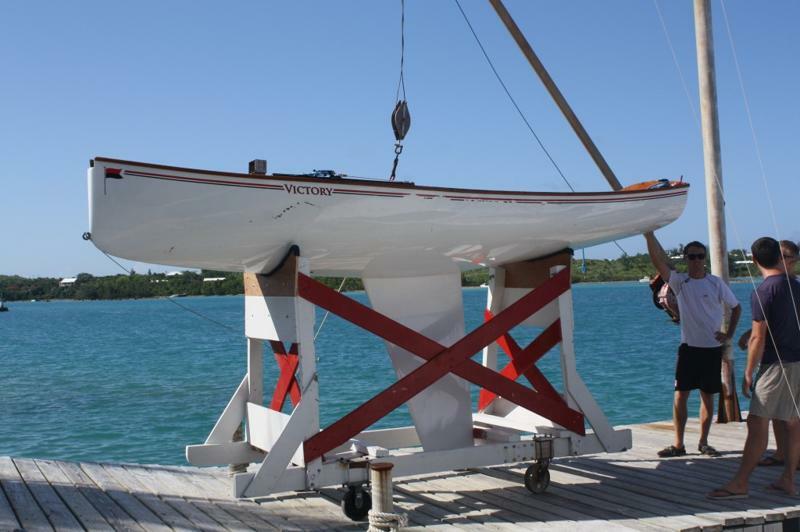 These crazy race boats are only 14 feet long, but carry a mast that is up to 40 feet tall! Rode Trip’s mast is only 44′ tall! We were intrigued and Audrey said she would make some phone calls and try to get us a spot on the committee boat. 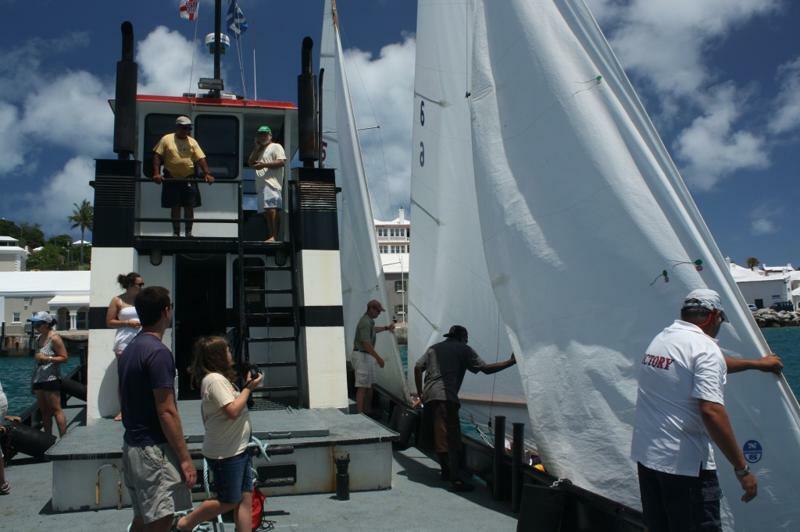 As we were leaving the club to head back to Rode Trip a friendly voice called down from the balcony, “Are you the two interested in being on the committee boat this weekend?” We stopped and looked up to meet Gary, a supporter of the St. George’s dinghy Victory. Gary told us that there would be plenty of room on the committee boat and we were welcome to join in the event. As we were saying our goodbye’s he asked if we had a lot of dinghy sailing experience. After telling him about racing lasers in New Hampshire he informed me that there just might be an open crew position on the Victory. Sunday morning we met up with the crew at the Sports club and started assembling the dinghy. 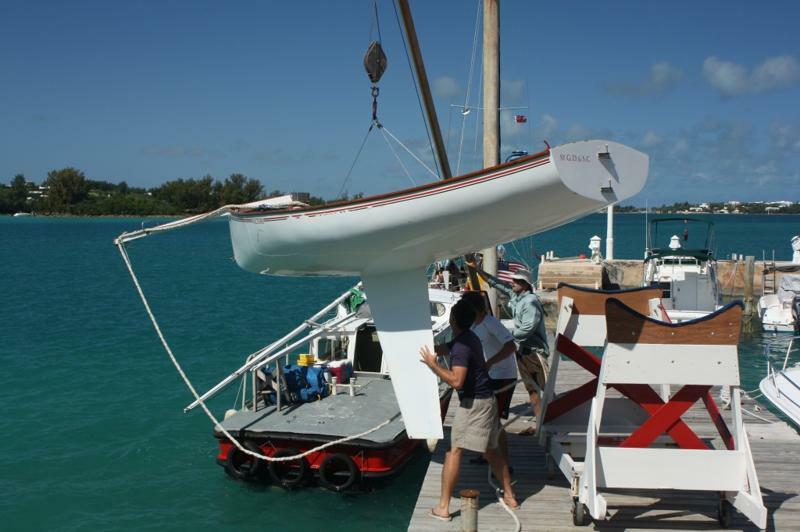 First step attach the bowsprit (12′) and launch the boat. Then we loaded up the rig selection for the day. 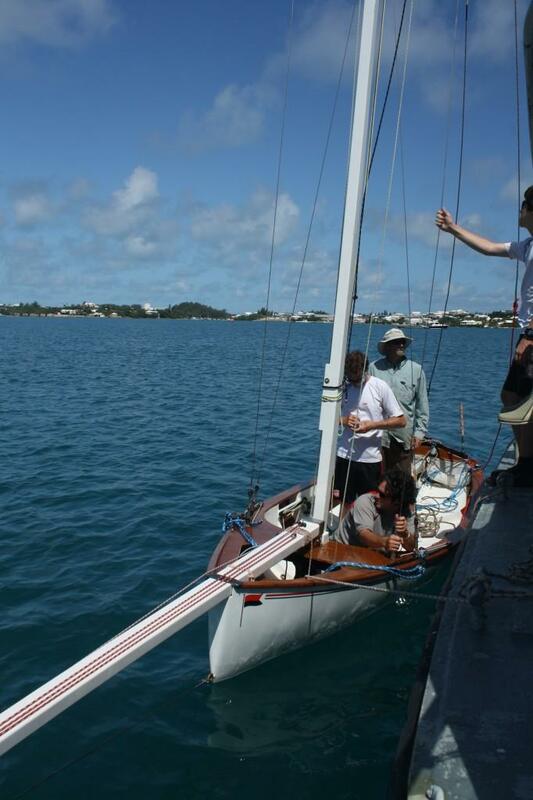 Our skipper Tom chose the #2 rig. 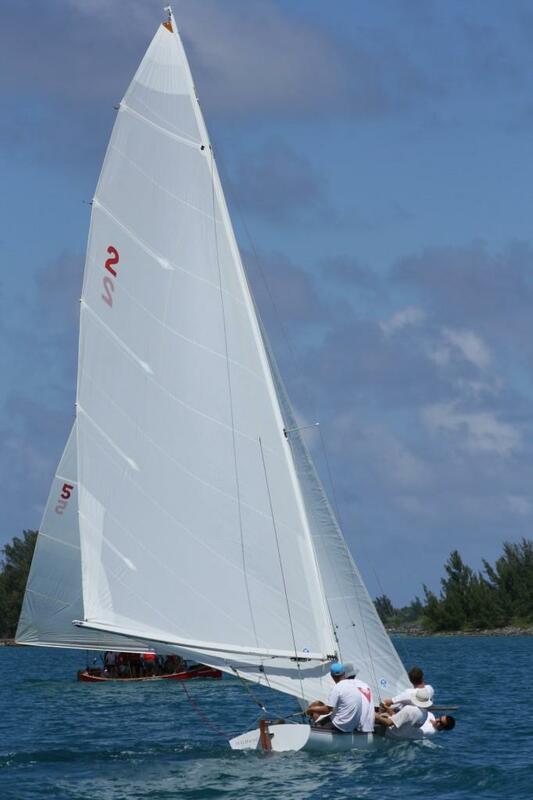 There are three different sizes of rig for the dinghy # 1 is a light air rig with a 40′ mast, #2 is smaller with a 32′ mast and #3 is for heavy air with a 25′ mast. 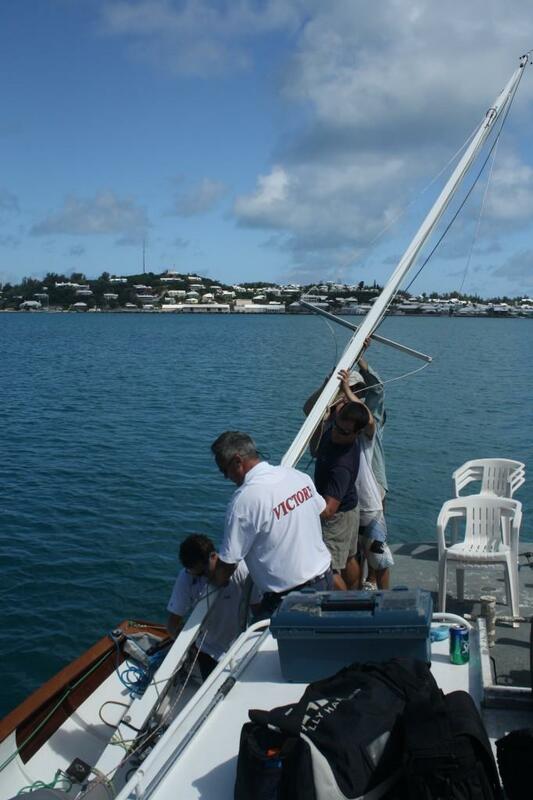 We loaded the mast, boom, sails, spare parts and tools onto the support boat and headed out to a mooring to rig the boat. All hands to raise the mast! Once the mast was raised we had to keep at least 3 people in the dinghy just to keep it upright, and this was without any sails! With 8 people helping the sails went up quick and the crew headed out for the first race, unfortunately I didn’t get to sail in the first two races, but had a great time watching. 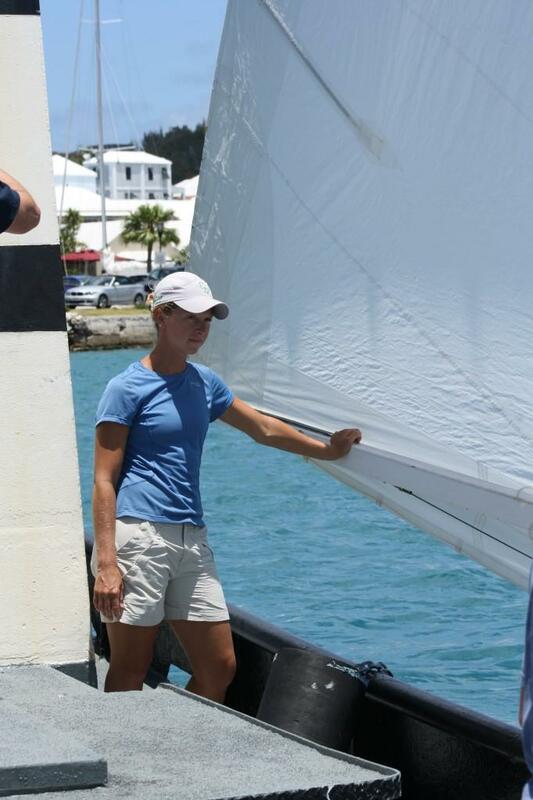 Stephanie helped on the starting boat for the first race. For the second race Skipper Tom’s girlfriend Leatrice came by in her powerboat and followed the Victory giving us a play by play of everything that was going right and wrong on board the dinghy. We learned that she had represented Bermuda in the 2004 Olympics for sailling! 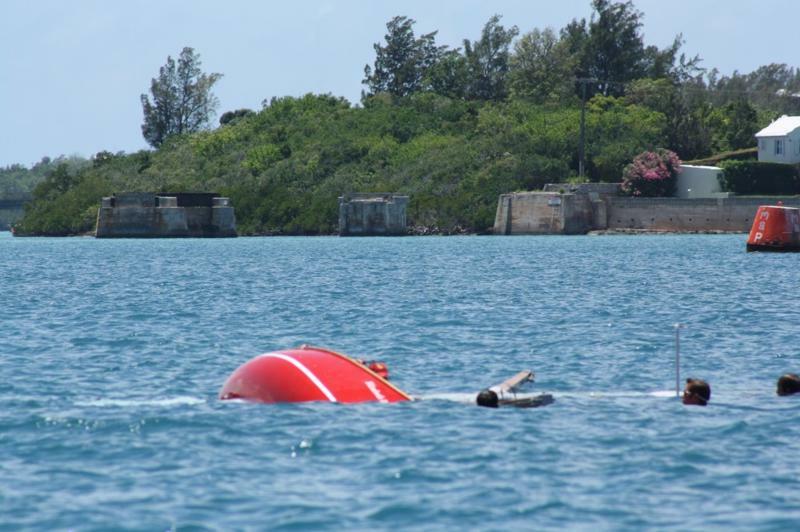 During the second race the crew of Elizabeth didn’t move their weight quite fast enough and ended up sunk. It took a long time to get the boat upright and floating again. For race 3 Tom decided that a little more weight would help and I was selected as crew. We had a GREAT race, taking first place! I haven’t hiked ( held my weight out over the water by tucking my feet under a strap) that hard in a long time! It was a great day of racing and meeting new friends. Leatrice even invited us to come down to Hamilton on Wednesday for “big boat” (not dinghy) racing. 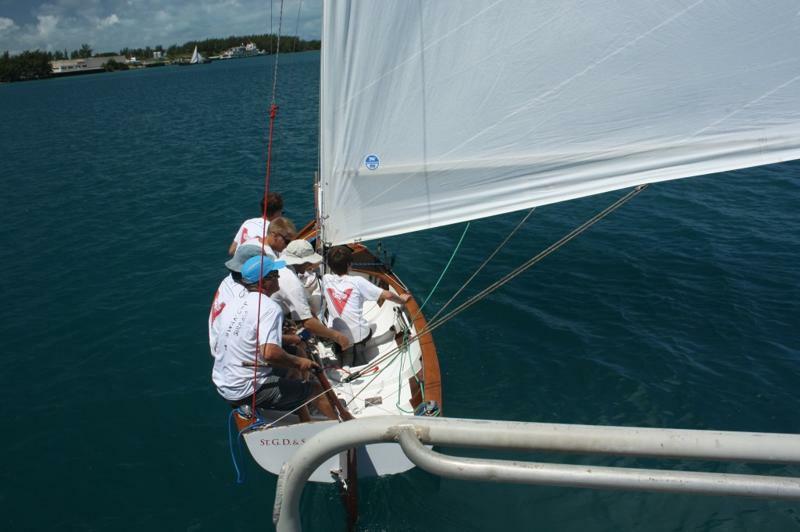 This entry was posted in Uncategorized and tagged bermuda, bermuda dinghy, dinghy, fitted dinghy, race, racing, St. George's by Brian. Bookmark the permalink. hey guys! i have just spent some time on your blog and am very much enjoying it. i REALLY appreciate your quarterly post on miles traveled, $$ spent, and fish caught. i think you published it in april but the comment section was closed. that post was so wonderfully helpful for someone like me who is wondering what real life (expenses and such) will be like. thank you so much!